Wendy began knitting and sewing in childhood, following the examples of her mother and grandmother. Having learned to knit before she could follow a knitting pattern, she began to design her own simple shapes. She sewed much of her wardrobe through high school and her early married life in order to have clothes that fit her small frame and creative imagination. She was also an active actress in high school drama festivals and benefits. Leaving performing aside at McGill University, she began to pursue her ambition to be an architect in the early seventies. 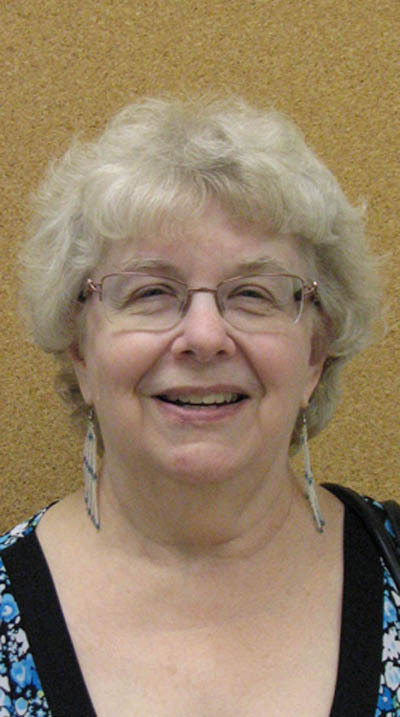 After marrying a Haligonian and moving to Halifax, she completed a BFA (Nova Scotia College of Art and Design, 1974, specializing in textiles) as a prerequisite for entering the architecture program at the Technical University of Nova Scotia. This goal was again shelved as she began a family, and continued to weave, sew, and knit as her creative outlet. She occasionally worked as a draughtsman and residential designer for local architects when the opportunities arose. Economic downturns and a passion for weaving challenges led her to return to school for a MFA in textiles (Nova Scotia College of Art and Design, 1997). Her thesis study of velvet weaving has expanded into a on-going pursuit. This work became the foundation of her workshops and original scholarly contributions in the textiles field involving experimental archaeology. With more questions about artistic teaching that she wanted to explore, she completed an MA in Art Education (Nova Scotia College of Art and Design, 2002), developing the idea of artistic intelligence and its cultivation in art education. She began part-time teaching in 1999 at the Nova Scotia College of Art and Design. Her courses have included the philosophy of art, textile history, craft history, graduate pedagogy, and graduate research. More recently, she taught costume history at Dalhousie University for a year. From 2002 to 2010, she worked on her interdisciplinary Humanities PhD (Concordia University, 2011), undertaking a detailed examination of BFA craft education in Canada. She also undertook the technical analysis and documentation of the collection of Coptic textiles at the Musée des Beaux-Arts de Montréal and wrote accompanying explanatory essays for a catalogue of the collection. Since 2008, she has done technical analyses of archaeological textiles excavated in Québec City and Louisburg for Parks Canada Conservations Services. In 2011, she was invited by Eva Knoll to collaborate on the study of the mathematics in textiles, examining the Mary Harris collection at the Constance Howard archive at Goldsmith’s College, London, and assisting in a conference workshop in Portugal. These experiences led fluidly to a very productive partnership, strengthened with the inclusion Tara Taylor.